As I already expected, someone will notice that I didn't care about longitude -180/180. Recently, User "InsertUser" reported on Github that OpenStreetBrowser stops working, if you wrap over the antimeridian. Solving this issue was quite tricky. I can report, that everything should work now. A few days ago, Ivan Seoane showed me weblate - an open source translation management system. Very nice and very suitable for OpenStreetBrowser. I installed it right away, you can find it here: https://weblate.openstreetbrowser.org. Also, Ivan is working on the translation for Galician, which is already available. 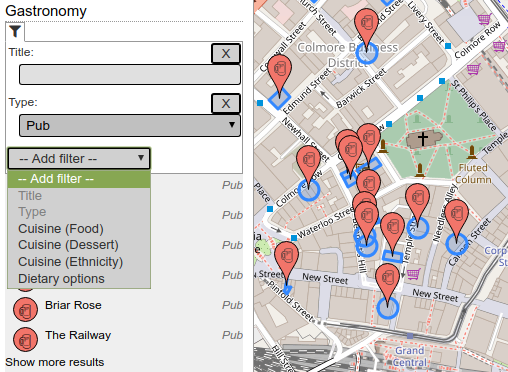 Gastronomy category filtered for pubs in Birmingham, showing possible additional filters. This update brings some nice improvements concerning localization: repository-specific language strings, localized start_date and opening_date and a brand-new translation overview page listing all translators. 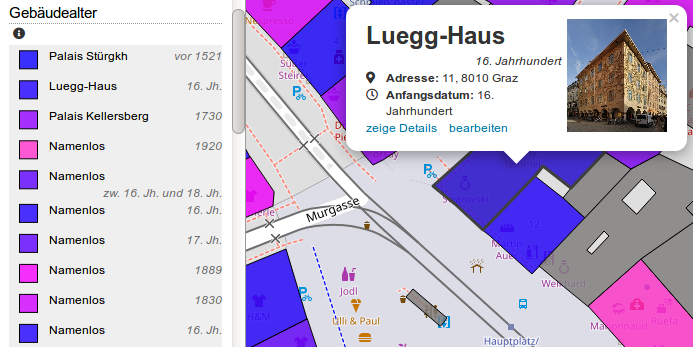 Again buildings age in Graz, Austria (haven't found many places so well mapped). This time with German dates. Note also the image, included via Wikidata. The current category update has been in the making for quite some time. 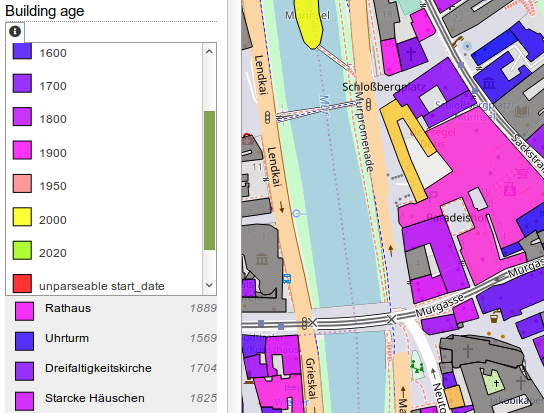 The main changes are more detailed categories about buildings (type, age, height, ...), an inclusion of map features with office tags in thematic maps and more detailed popups in the Culture categories. Age of buildings in the city centre of Graz, Austria. 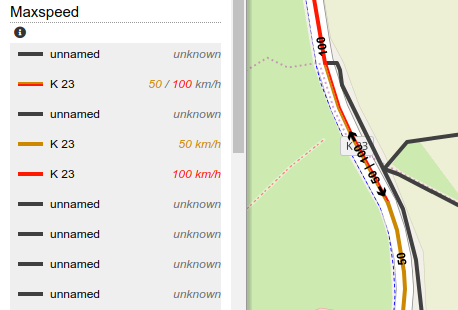 User mahdi1234 pointed out, that roads which have different maxspeed tags for each direction (tags maxspeed:forward and maxspeed:backward) would be regarded as "unknown" by OpenStreetBrowser. From now on the car maxspeed and railway maxspeed categories handle these tags. Forward maxspeed will always be shown to the right of the way, backward to the left. Just released a minor upgrade. The Wikipedia / Wikimedia Commons integration got a few updates (see https://github.com/plepe/OpenStreetBrowser/pull/76 for details). Also bugfixes. Uses the new @LeafletJS version 1.4.0! 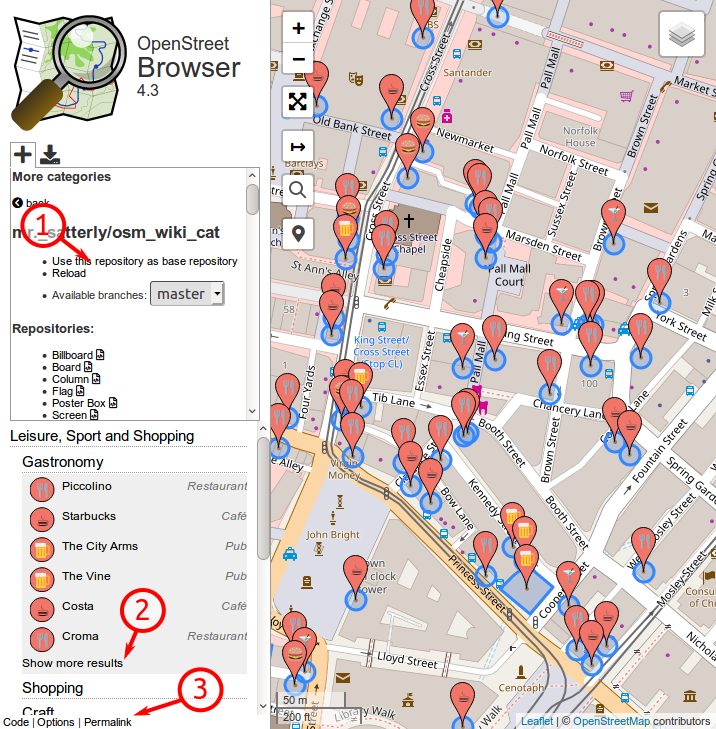 There's a new OpenStreetBrowser version, 4.2 with some new interesting features! Christmas features - as they are temporary - should be checked and updated every year. 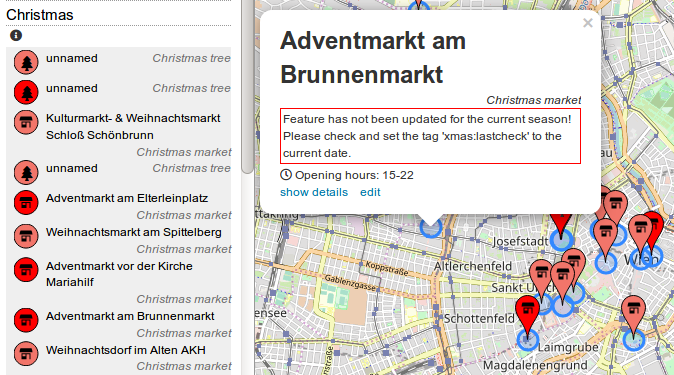 The christmas map in OpenStreetBrowser now shows outdated features with a red marker and a note in the popup.